There are as many reasons for raising Texas Longhorns as there are colors and horn shapes! Lean Meat - Longhorns process their food in such a way that they are typically leaner than the European breeds. Texas A & M University research shows that Texas Longhorn steaks have approximately 30% less muscle fat and 15% less saturated fat than steaks from European beef breeds. The marbling, flavor and grade are similar. In another study, longhorn meat was found to be lower in fat and cholestrol than white meat chicken. Even though it is as lean as deer meat, our beef tastes like beef and not deer, elk, buffalo or any other lean animal. "You can have your steak and eat it too!" Longevity - Most people new to the longhorn breed are amazed at how many years a cow can claim her spot as a producer and productive member of the herd. Most longhorns breed well into their teens with some still productive far into the twenty's. For the cattleman, that means less dollars developing replacement heifers. Browse Utilization - Depending on climate and "browse" (weeds, trees and brush) available, a longhorn cow can maintain herself and her calf for less hay and feed than the European breeds. We laugh about our cows having "weed day" where they seem to strip the leaves from the weeds, trees and brush they can reach. They definitely don't turn their nose up at good grass or hay either. 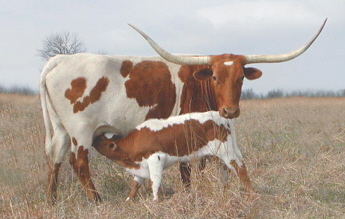 Reproductive Efficiency - The typical longhorn calf has a narrow head and shoulders, making calving easy for the cow. The average longhorn birthweight is 20 to 30 pounds below some of the European breeds, however, they gain very quickly and with proper feed, wean very, very well. Many cattlemen use longhorn bulls in their programs on first calf heifers or small cows to avoid the high vet costs, dead cows and calves. Longhorn calves are quick to rise and nurse and the typical longhorn cow is a very good, attentive mother. The U.S. Meat Animal Research Center at Clay Center, Nebraska has evaluated 1,905 births comparing 11 breeds. The Texas Longhorn proved superior with the highest unassisted birth rate of all breeds (99.7%) and the lowest birth weight (71.3 lbs.) These low stress birth traits profit owners when the mother cow quickly re-breeds after an easy birth. Temperment - Although most people have images of Charles Russell paintings in their head whenever they think of longhorns, they are really very gentle, docile animals. We have 3 young boys and they play in the pastures, fish and hike, so we can't afford to have any nasty attitudes in our animals. We had one years ago that we purchased at a sale who ended up being very nasty, so we took her to the butcher and steered her calf. If handled quietly with appropriate facilities, most cattle are extremely easy to handle...longhorns especially! Disease Resistance - After over 500 years of development by nature, only the hardiest and most disease resistant cattle lived to breed and passed on those qualities to their offspring. Today we enjoy cattle that are resistant to pink eye, hoof rot and many other ills that plague the European breed cattle. In order to give our cattle the best chance at developing up to their genetic potential, we worm, vaccinate and feed a good mineral year round to insure that our cattle are as healthy as possible. Adaptability - Longhorns are so adaptable, they can be found in virtually every climate from the tropics to Alaska and Canada. They will go out and breed while having to walk miles to get enough grass and water to support themselves, survive a tough winter and bring in a big, fat calf in the spring. Of course, those are not the optimum conditions and a person would want to make life as prosperous as possible for them. The better care you take of them, the healthier your cattle are and the better your return will be. 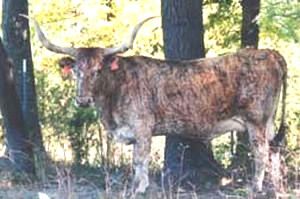 Unique - Texas Longhorns are a very unique breed. Their colors are as varied as the rainbow. There are reds, blacks, whites, purples, oranges, blues, roans, tiger striped, spots and speckles... Out of any mating, you can never guarantee just what color you will get. You can also have many, many different horn shapes; flat, twisted, curled, swooped, scooped and reaching to the moon. They also have many different personalities. You will have a lead cow who tends to be the first to water, first to feed, first to shelter and tending to boss the rest of the herd. You will often find a steer babysitting the calves during the day while the momma's go off to graze, then at night, the cows will gather in an informal circle with the calves in the middle as if to ward off any interlopers or dangers to the babies. They certainly are unique animals! Cross Breeding - Many cattlemen use longhorns across their European breed cattle to get "hybrid vigor". This means the cattle traits are genetically strengthened making the calves gain thicker and faster than within a purebred program. Marketing Possibilities - Following behind the varied colors, horn shapes and personalities, come the many different marketing possibilities. Recreation - Many people who raise longhorns do so to stock their roping or team penning facility. Others use AI (Artificial Insemination) from some of the world's best bucking bulls on their cows to provide for the rodeo market. Other events involving longhorns are steer wrestling and calf roping. Contrary to popular belief, most rodeo stock contractors (the guys who provide the animals for the rodeo) take very good care of their stock. They make sure the animals have proper nutrition, health care and are handled properly. Those animals are their livelihood and they can't afford to have them sick or injured. Lean Meat - Since longhorn meat is lower in fat and cholestrol than white meat chicken, many health professionals recommend longhorn meat. Some have even turned to breeding longhorns themselves! You know the layer of fat on your hand after making hamburger patties from hamburger purchased at the grocery store? With longhorn meat, there is NO layer of fat to be scraped off your hands. However, they do have enough fat in them to stick together and not fall apart in the pan. Longhorn burgers also stay about the same size as they were when you put them in the pan. Very little shrinkage! Due to the leaness, though, you will want to cook the meat at a lower temperature than you might cook other beef since there is less fat to insulate the red muscle tissue and it is easier to overcook. Commercial Bulls - Cattlemen today are interested in lowering costs. By using a longhorn bull on their first calf heifers (young females who haven't been bred before) they can save themselves the worry of these young females having problems delivering calves that are too large for the heifer. Longhorn bulls tend to weigh a little less than the European bulls, thus they don't injure the cattle they are breeding. Their calves have smaller heads and shoulders and make it easier for the new momma to deliver her first baby. Commercial Cows - Since the longhorn cow is able to calve for many years (easily into the late teens and sometimes twenties...European breeds tend to be considered old at 10 years of age. 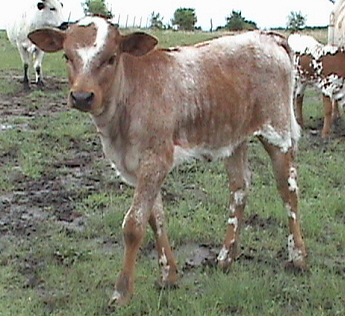 ), many cattlemen run a commercial herd of longhorn cows and a European breed bull. Events - How fun to be watching a fair or western show and see the United States flag carried out by a person riding a big, Texas Longhorn. Due to their uniqueness, many people gather around someone riding or driving a longhorn. They are favorites for parades, rodeos, fairs, western shows and exhibitions. Thanks to their gentle nature, they have been used a great deal in advertising items ranging from trucks to banks. Seedstock - How much fun to be part of a new breeder just getting started. That is something we enjoy so much. It has been our experience that new breeders are very enthusiastic and anxious to learn all they can. We have made some great friends selling seedstock and just answering questions. We love to talk longhorns ALMOST as much as we like to talk about our kids!! Horns & Hide - There is nothing more beautiful above the mantle on the fireplace than a huge set of Texas Longhorns. Many people desire these to hang in their house, cabin or office. We have seen some beautiful longhorn hide furniture as well. It wears like iron and adds just the right touch to that room with the western flavor. History - Tradition - Some folks feel they were born in the wrong century. We've had that feeling once or twice ourselves. There is something restful in walking out among the herd and just listening to them tear off a mouthful of prairie grass and munch as they quietly stroll along looking for another bite. There is something peaceful about hearing a new calf calling to it's mother and hearing "Mom" answer with a reassuring sound. 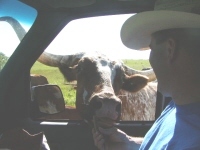 Owning a Texas Longhorn is like owning a piece of history!